Kotatsu is often the winter-time centerpiece of a home with the whole family sitting around it legs comfortably in the warm and hot tea on the tabletop. The Japanese Kotatsu should be directly translated into English as “Snuggly Electric Table Blanket” because that is exactly what it is. In Okinawa, having a kotatsu in your home is not as common as it is on the mainland where almost every home has one. 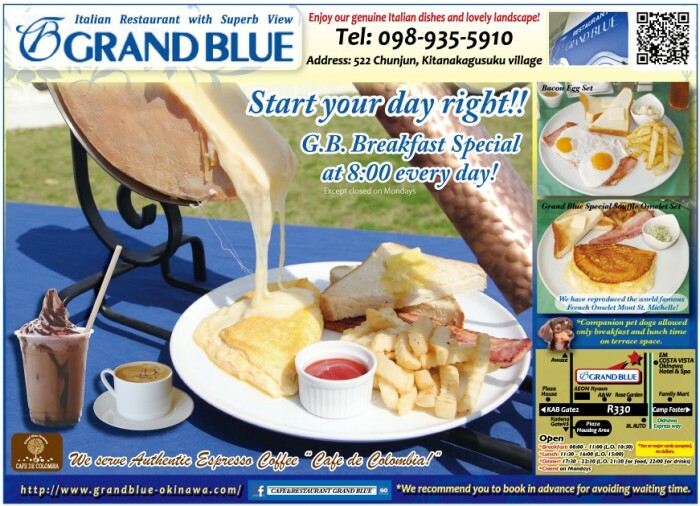 Lucky for us, Okinawa doesn’t get as cold as the mainland so we tend not to feel as inclined to curl up like a cat for warmth during our “cold” season. Many people remember kotatsu as their favorite place to keep warm and relax. Regardless of the colder weather, the houses on the mainland are usually poorly insulated, and are mostly built to same standards as our homes on Okinawa are. They are generally built using concrete block structures, which are cost efficient and strong against earthquakes and strong storms, but provide the bare minimum of insulation against cold temperatures. In addition, the majority of Japanese homes do not have central heating, as the practice of heating an entire home is considered wasteful. 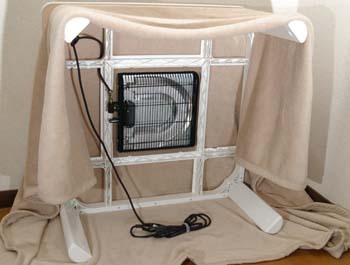 More often, space heaters are used in a home on a room-by-room basis. During half of the year, Japans’ mainland receives freezing cold temperatures and oftentimes snow. These are the months and conditions when a kotatsu snuggly blanket is a valuable commodity to have. Some would say that it is even mandatory. The original kotatsu was called “hori-gotatsu.” The hori-gotatsu was heated using charcoal in a pit dug about 40 centimeters deep under a table in the home. In the 21st century, an electric heater is attached to the underside of a table frame, which is no longer limited to wood, but can also be constructed of plastic or other materials. A blanket is then draped over the frame and under the tabletop. 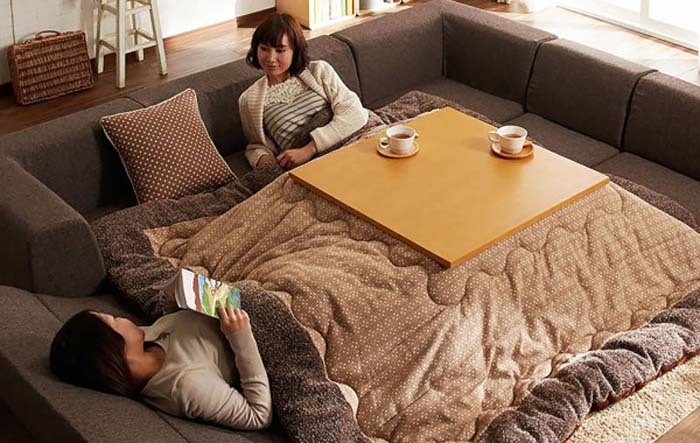 Essentially the kotatsu is a blanket that sandwiches your body between a tabletop where food and drink are set and a heating element underneath the table where the rising heat keeps you warm and cozy. The electric heating unit is under the ko-tatsu frame and the tabletop is separate. The idea is ingenious but not as transferable to North American homes where sitting on the floor is more of a novelty than a part of the culture. Even during the coldest months, a North American family rarely even wears shoes in the house, and in some homes, carpets or slippers are common. In North American culture, there seems to be more of a concern about tracking snow and dirt into the house than there is for wasting heat to empty rooms. My first experience using a kotatsu was at my mother-in-law’s home. Now, I often get extremely gassy even in the calmest of situations so it was difficult to relax and enjoy as I was so focused on trying not to gas the entire family out. I would love to have my own separate kotatsu so that I am able to relax under the blanket without the worry of creating the “Dutch oven” effect for of those I share the blanket with. My wife tells me that I would become fat if we buy our own kotatsu because she knows that the only thing we will want to do under the kotatsu is sleep. Even reading a book while wrapped in the kotatsu has led to a series of yawns, which quickly resulted in a nod off session. 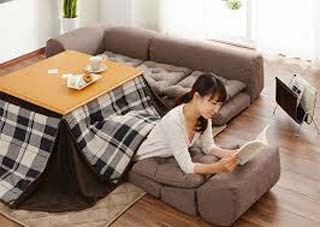 If you have never snuggled up in a kotatsu my suggestion is that you curl up under one during a Saturday morning cartoon watching session when you know that there is nowhere you have to rush to in any great hurry, and relax.